When the Sisters of Mercy decided to close two schools to open a new, combined school, they faced serious challenges and a rare opportunity. With deep involvement from all stakeholders, we created a brand that embraced their enduring legacy and pushed the school firmly into the future. We dove right into Catholic school life with qualitative and quantitative research involving current, competitive, and prospective parents and students; alumnae, faculty and staff; and several principals and assistant principals. We also did a comprehensive competitive analysis of other schools in the area. These insights led to a brand position that spells out what the new high school is, who it serves, and why it’s different and better than the competition. The new logo design is rich in meaning. Sisters of Mercy leads young women to live in a continual rhythm of contemplation and action. In the logo, inward facing arrows (contemplation) and outward facing arrows (action) meet at a center point. That center combines with the four cardinal directions to suggest five core values and a moral compass, which is further reinforced by the circular container shape. The negative space inside creates a Holy Cross. 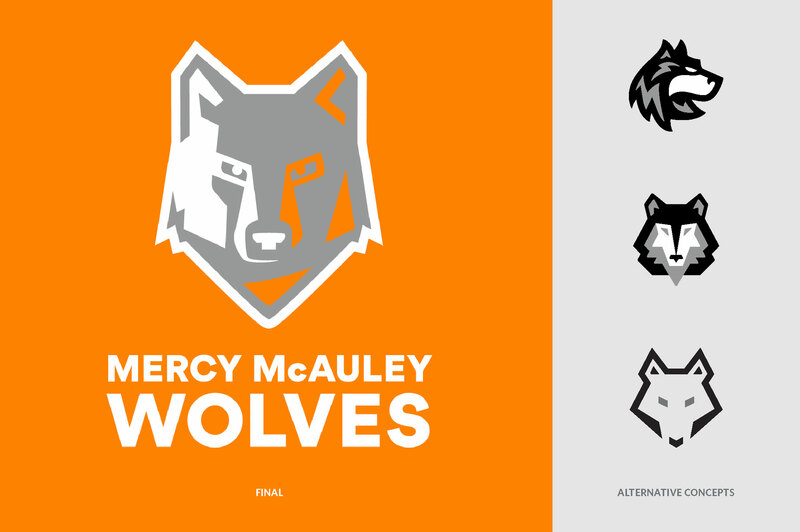 From initial surveys, the wolf was a strong candidate for the new team mascot. Wolves are fierce, strong, loyal, and intelligent. They’re pack animals, devoted to the good of the group. Wolves rise to challenges, solve problems, and win as a team. As we gained more input and involvement from students, the wolf quickly became the top choice. 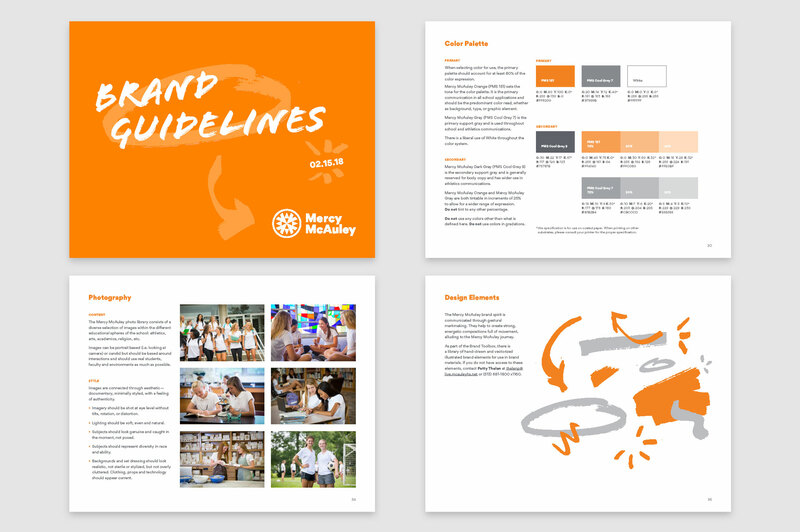 Comprehensive brand guidelines create consistency across all mediums and make it easy for stakeholder teams to “stay on brand”. 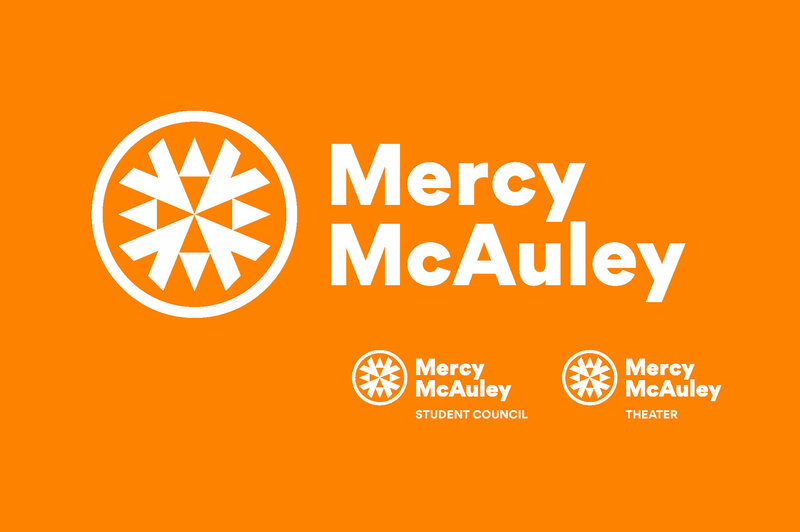 Since high school brands are usually carried out by many people, Mercy McAuley needed an even more comprehensive guide. Along with the standard voice and visual elements, we also included detailed instructions for athletic uniforms, and sub identities for extracurricular and spirit wear. Recruitment is the fuel for any school, especially a brand new one. The look and tone had to immediately stand out for a differentiating and exciting first impression. These recruitment ads speak directly to 7th and 8th grade girls and their parents. 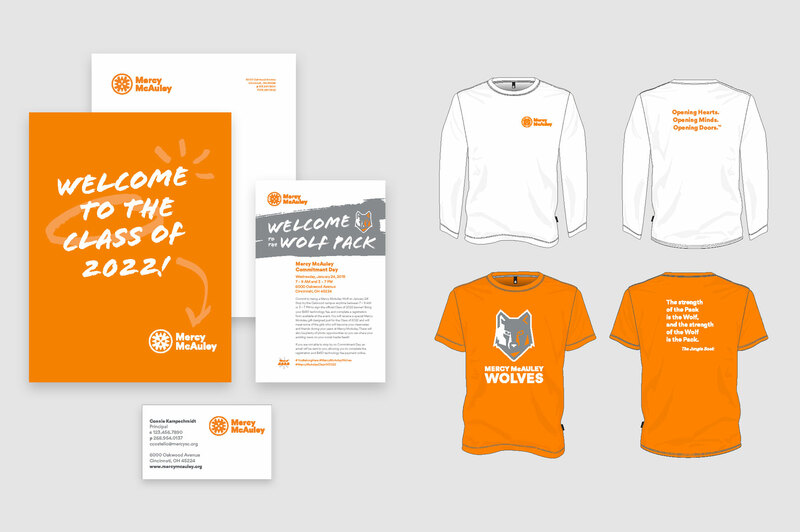 Each strategically deploys a few bold brand elements and the brand voice to emotionally connect and drive awareness. Consistency and cohesion are vitally important for a new school and a new brand. 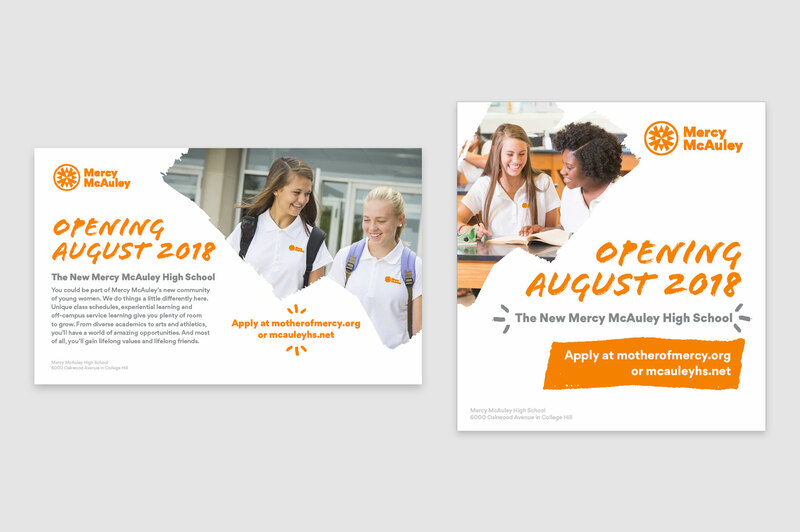 We made sure that the Mercy McAuley brand would be flexible enough to work successfully across all mediums—from notebooks and pens to admission packets and spirit wear.